The Japanese New Year (正月, Shōgatsu) is an annual festival with its own customs. Since 1873, the official Japanese New Year has been celebrated according to the Gregorian calendar, on January 1 of each year, New Year's Day (元日, Ganjitsu). However, some traditional events of the Japanese New Year are partially celebrated on the first day of the year on the modern Tenpō calendar, the last official lunisolar calendar which was used until 1872 in Japan. Prior to the Meiji period, the date of the Japanese New Year had been based on Japanese versions of lunisolar calendar (the last of which was the Tenpō calendar) and, prior to Jōkyō calendar, the Chinese versions. However, in 1873, five years after the Meiji Restoration, Japan adopted the Gregorian calendar and the first day of January became the official and cultural New Year's Day in Japan. 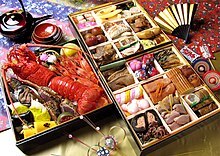 Japanese people eat a selection of dishes during the New Year celebration called osechi-ryōri (御節料理 or お節料理), typically shortened to osechi. Many of these dishes are sweet, sour, or dried, so they can keep without refrigeration—the culinary traditions date to a time before households had refrigerators, when most stores closed for the holidays. There are many variations of osechi, and some foods eaten in one region are not eaten in other places (or are considered inauspicious or even banned) on New Year's Day. Another popular dish is ozōni (お雑煮), a soup with mochi rice cake and other ingredients that differ based on various regions of Japan. Today, sashimi and sushi are often eaten, as well as non-Japanese foods. To let the overworked stomach rest, seven-herb rice soup (七草粥, nanakusa-gayu) is prepared on the seventh day of January, a day known as jinjitsu (人日). Another custom is to create and eat rice cakes (餅, mochi). Boiled sticky rice (餅米, mochigome) is put into a wooden container usu (臼) and patted with water by one person while another person hits it with a large wooden mallet. Mashing the rice, it forms a sticky white dumpling. This is made before New Year's Day and eaten during the beginning of January. Mochi is made into a New Year's decoration called kagami mochi (鏡餅), formed from two round cakes of mochi with a tangerine (橙, daidai) placed on top. The name daidai is supposed to be auspicious since it means "several generations." At midnight on December 31, Buddhist temples all over Japan ring their bells a total of 108 times (除夜の鐘 joyanokane) to symbolize the 108 human sins in Buddhist belief, and to get rid of the 108 worldly desires regarding sense and feeling in every Japanese citizen. A major attraction is The Watched Night bell, in Tokyo. Japanese believe that the ringing of bells can rid their sins during the previous year. The bell is rung 107 times on 31st and once past midnight. It is also very common to eat buckwheat noodles called toshikoshi soba on the New Year's Eve. The end of December and the beginning of January are the busiest times for the Japanese post offices. The Japanese have a custom of sending New Year's Day postcards (年賀状, nengajō) to their friends and relatives, similar to the Western custom of sending Christmas cards. Their original purpose was to give your faraway friends and relatives tidings of yourself and your immediate family. In other words, this custom existed for people to tell others whom they did not often meet that they were alive and well. It is customary not to send these postcards when one has had a death in the family during the year. In this case, a family member sends a simple postcard called mochū hagaki (喪中葉書, mourning postcards) to inform friends and relatives they should not send New Year's cards, out of respect for the deceased. People get their nengajō from many sources. Stationers sell preprinted cards. Most of these have the Chinese zodiac sign of the New Year as their design, or conventional greetings, or both. The Chinese zodiac has a cycle of 12 years. Each year is represented by an animal. The animals are, in order: Rat, Ox, Tiger, Rabbit, Dragon, Snake, Horse, Goat, Monkey, Rooster, Dog, and Pig. 2008 was the year of the Rat, 2009 Ox, 2010 Tiger, 2011 Rabbit, 2012 Dragon, and 2013 was the year of the Snake. Famous characters like Snoopy, (2006) and other cartoon characters like Mickey and Minnie Mouse, (2008) have been especially popular in their celebrated years. Addressing is generally done by hand, and is an opportunity to demonstrate one's handwriting (see shodō). The postcards may have spaces for the sender to write a personal message. Blank cards are available, so people can hand-write or draw their own. Rubber stamps with conventional messages and with the annual animal are on sale at department stores and other outlets, and many people buy ink brushes for personal greetings. Special printing devices are popular, especially among people who practice crafts. Software also lets artists create their own designs and output them using their computer's color printer. Because a gregarious individual might have hundreds to write, print shops offer a wide variety of sample postcards with short messages so that the sender has only to write addresses. Even with the rise in popularity of email, the nengajō remains very popular in Japan, although the younger generation hardly send any cards, preferring to exchange digital greetings using their mobile phones. In recent years this digital greeting preference is gradually accepted among the society. Pouch for giving money called otoshidama-bukuro (お年玉袋). Pouch (ポチ袋）made of origami (折り紙). On New Year's Day, Japanese people have a custom known as otoshidama where adult relatives give money to children. It is handed out in small decorated envelopes called pochibukuro, similar to Shūgi-bukuro or Chinese hóngbāo and to the Scottish handsel. In the Edo period, large stores and wealthy families would give out a small bag of mochi and a Mandarin orange to spread happiness all around. The amount of money given depends on the age of the child but is usually the same if there is more than one child so that no one feels slighted. It is not uncommon for amounts greater than ¥5,000 (approximately US$50) to be given. It was also customary to play many New Year's games. These include hanetsuki, takoage (kite flying), koma (top), sugoroku, fukuwarai (whereby a blindfolded person places paper parts of a face, such as eyes, eyebrows, a nose and a mouth, on a paper face), and karuta. There are many shows created as the end-of-year, and beginning-of-year entertainment, and some being a special edition of the regular shows. For many decades, it has been customary to watch the TV show Kōhaku Uta Gassen aired on NHK on New Year's Eve. The show features two teams, red and white, of popular music artists competing against each other. The final of the Emperor's Cup, the national association football elimination tournament in Japan, takes place on New Year's Day, generally in the Olympic Stadium in Tokyo, though it can be moved if the stadium is under renovation. The final has taken place on New Year's Day since 1969 and is usually aired on NHK. Beethoven's Ninth Symphony, with accompanying chorus, is traditionally performed throughout Japan during the New Years season. In December 2009, for example, there were 55 performances of the symphony by various major orchestras and choirs in Japan. The Ninth was introduced to Japan by German prisoners-of-war held in Japan during World War I. Japanese orchestras, notably the NHK Symphony Orchestra, began performing the symphony in 1925. During World War II, the Imperial government promoted performances of the symphony, including on New Year's Eve, to encourage allegiance to Japanese nationalism. After the war, orchestras and choruses, undergoing economic hard times during the reconstruction of Japan, promoted performances of the piece around New Years because of the popularity of the music with the public. In the 1960s, performances of the symphony at New Years became more widespread, including participation by local choirs and orchestras, and established the tradition which continues to this day. There is also an associated festival of Little New Year (小正月, koshōgatsu), traditionally celebrating the first full moon of the new year, on the 15th day of the first lunar month (approximately mid-February). This is now sometimes celebrated on January 15, in various respects. The main events of Koshōgatsu are rites and practices praying for a bountiful harvest; rice gruel with adzuki beans (小豆粥, azukigayu) is traditionally eaten in the morning and is involved in the rice gruel divination ceremony. Further, New Year decorations are taken down around this date, and some temples hold events, such as at Tōrin-in. This corresponds to the Chinese Lantern Festival. Wikimedia Commons has media related to New Year celebrations in Japan. ^ Brasor, Philip, "Japan makes Beethoven's Ninth No. 1 for the holidays", Japan Times, 24 December 2010, p. 20, retrieved on 24 December 2010; Uranaka, Taiga, "Beethoven concert to fete students' wartime sendoff", Japan Times, 1 December 1999, retrieved on 24 December 2010. ^ Brasor, Philip, "Japan makes Beethoven's Ninth No. 1 for the holidays", Japan Times, 24 December 2010, p. 20, retrieved on 24 December 2010.